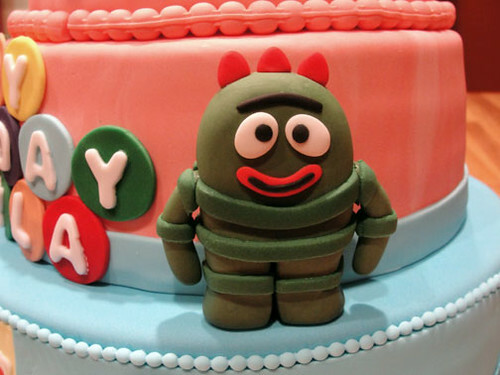 It's time for a Yo Gabba Gabba cake! 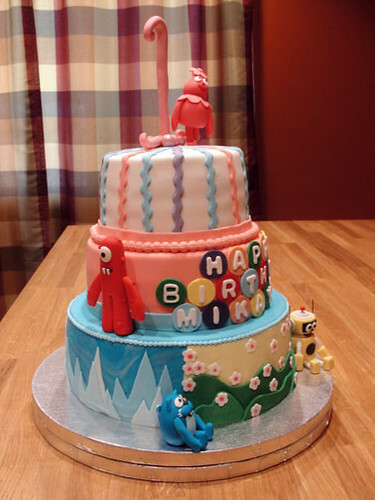 Before designing this cake, I have never even seen one single episode of Yo Gabba Gabba. I know.. I know. Now, I own a few of the dvds, and I can even sing a few of the songs. I have to admit, the show is quite fun. Plus, the showcase of musical guests keeps my son entertained. . . Who doesn't like the Roots?! 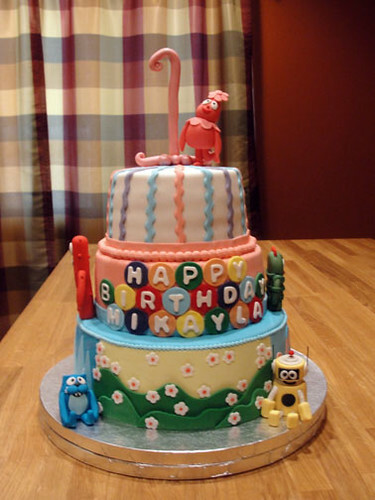 I can see why Mikayla loves the show, and this was the perfect cake for her first birthday. A few months ago, John contacted me about a cake for his niece. He's a long time friend of the family, and I was happy to take on what ever he had in mind. I learned that her favorite character was Foofa, the cute pink one with the flower on her head. 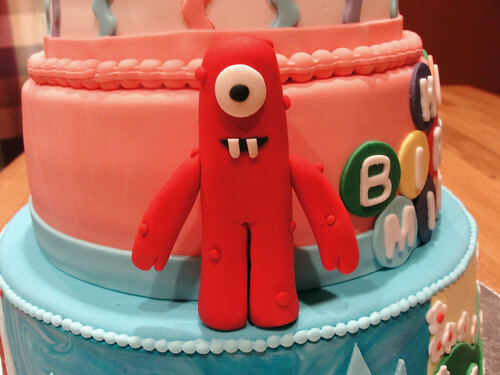 John sent me several examples of Yo Gabba Gabba cakes, and told me what his sister liked about each one. I took those ideas came up with a design that showcased the four different character themes, and sugar models of the five characters - Muno, Brobee, Toodee, Plex, and Foofa. This cake was meant to feed around 50 guests, standing 3 levels stacked high of vanilla and raspberry goodness! The week prior to delivery, I spent hours watching a dvd that I had borrowed from a friend and taking notes. I sketched out the characters, and printed out images I found on the internet for references. Using gumpaste and fondant, I started on the sugar models of the characters. Each one was created in the same order, starting with the torso, the head, and then the limbs. A great thing I've learned through my past experience is that creating the head after the torso helps keep everything in proportion. I've had to remodel figures because the heads were too big for the body. On the torsos, I used a ball tool to created sockets for the arms and legs to fit into. This creates a cleaner look. 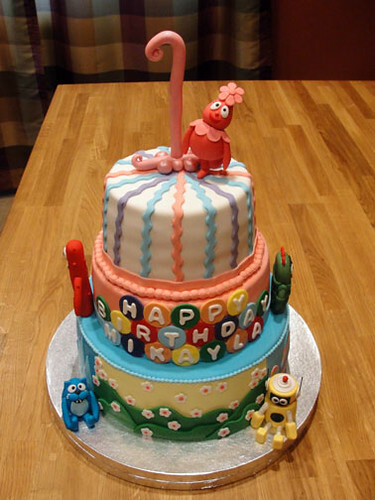 Skewer sticks and toothpicks help the legs support the body upright and can be used as inserts onto the cake. I crumbled up tissue under any areas that needed support while drying to reduce any hard blemishes. The faces were done last with the help of small round cutters, or cut freehand with an exacto knife. Small details such as the lashes were drawn on with a fine tip edible marker. They are the best thing to purchase if you want to create sugar figures or draw very fine lines on a cake. With the figures done and left aside to dry, it was time to create the cake. 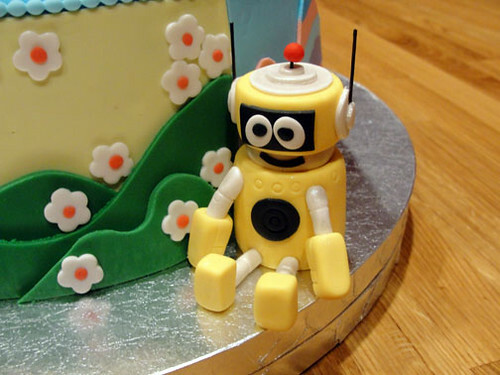 Each level of cake had it's own design element that required attention. The bottom level showcased the four homes of the characters - Munoland, Brobeeland, Toodeeland, and Foofaland. Each one also represented the 4 seasons of summer, fall, winter, and spring. To divide the cake evenly into the 4 scenes, I measured the circumference of the cake after it was torted and covered with a bright blue fondant. This gave me the correct width of space for each scene. I cut out a fondant rectangle of each background color and attached them to the cake with a little water. Using the print outs as a reference, I cut out elements of each scene and attached them to the cake in layers for a dimensional look just like the show. Colors play a very huge part in each of the scenes so using techniques such as marbling or color blocking helped. Marbling two shades of blue allowed for a cold winter sky in Toodeeland. Do you see the rock formations in Munoland? 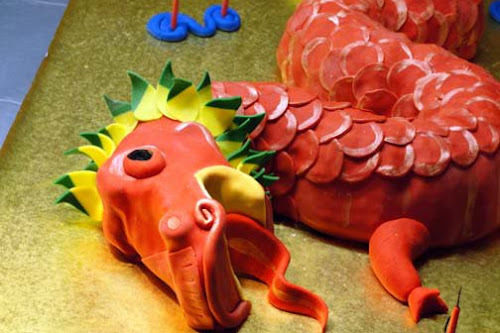 Those were created by laying down thin ropes of different colored fondant next to each other and rolling it out at once. I then cut out the shapes of the rock formations with a knife. The second level was torted and covered with a marbled pink fondant. I cut out 3/4 inch circles out of different color fondant and laid them out to create a bright message board where "Happy birthday Mikayla" in white fondant would sit. 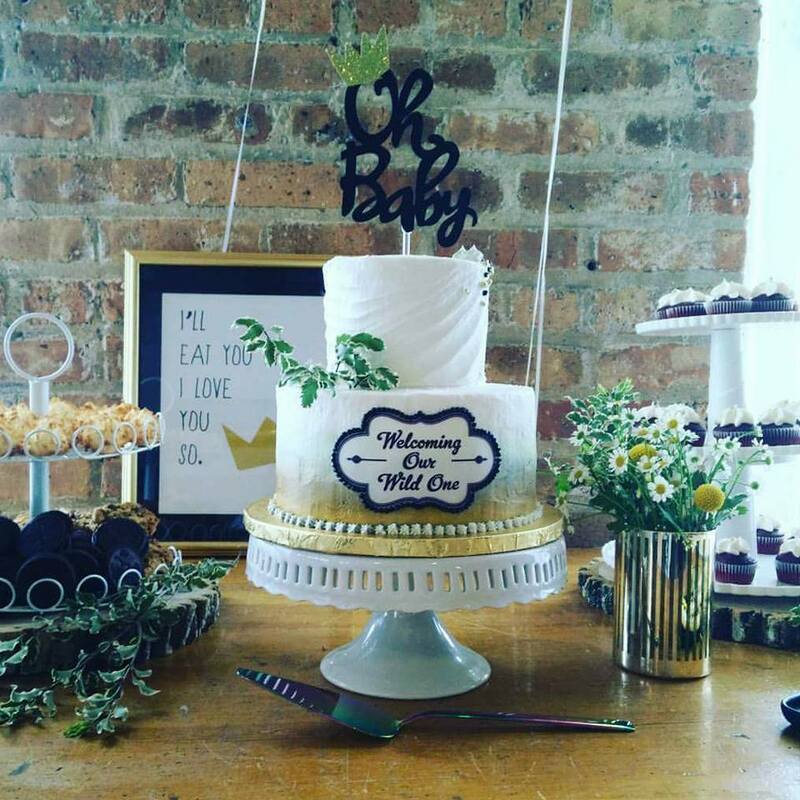 I arranged the message on a parchment paper before attaching it to the cake just to make sure I had the spacing right. 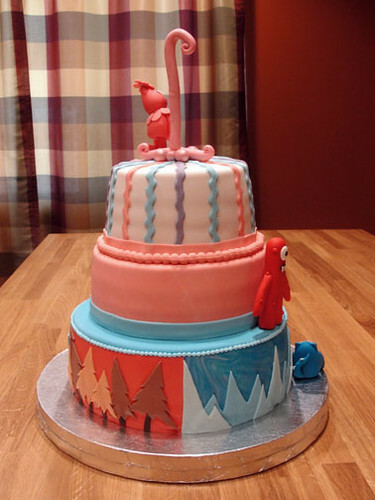 A ribbon of the same blue fondant from the layer below accents the bottom of the second level. The top level was covered in white and received a fun, whimsical striping treatment. I used a wavy ribbon cutter and cut out 1/4 inch stripes of light blue, purple, and light pink fondant. I attached these across the top and down the sides of the cake, alternating in colors. I don't like the bump that can be creating by overlapping ribbons on the top of the cake, so my ribbons only really meet in the center and don't really overlap. I cut off the areas that on top of another ribbon to create a seamless fit. This was then accented with a ribbon and pink fondant beading. 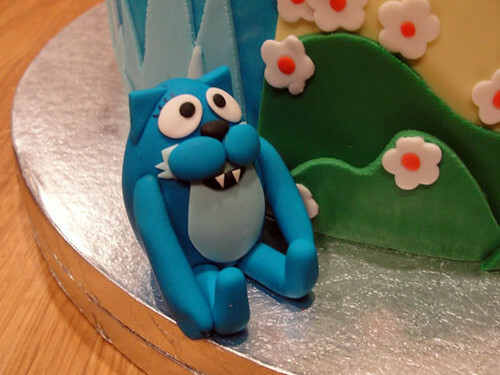 The characters were then inserted into the cake and secured with a touch of piping gel. To finish off the cake, I rolled out a whimsical #1 supported by a wooden skewer. I brushed on some shimmering rose dust to give it a little bit of shine. 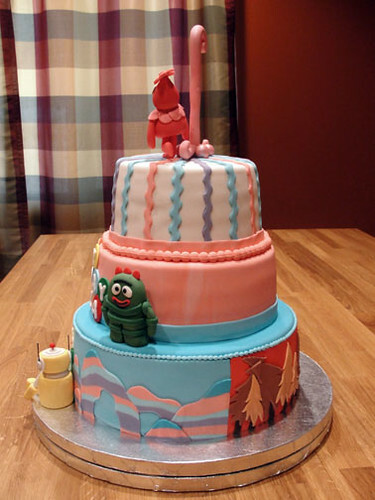 Once this was dried, I inserted it into the cake and yelled, "Yo Gabba Gabba!"